Let them take you to some of Australia's most iconic destinations. An outback wilderness adventure is a travel experience unlike any other. The vibrant hues of ancient and pristine lands seen by only a handful of people, rare and incredible flora and fauna, the extraordinary characters and the intricate way nature weaves its magic across a country as old as time itself, is an Australian sensory experience like no other. Kirkhope have been bringing people to the Outback for more than 40 years. They have a long history as one of Australia’s most professional tour operators taking small groups of adventurers on some of the most astonishing Australian expeditions. Their modern fleet of twin-engined aircraft is designed to fly people in comfort to remote destinations and their seasoned pilots are also skilled guides who act as your hosts for the duration of your tour. All their aircraft have large windows and everyone gets a window seat so that the experience can be enjoyed both in the air and on the ground. It’s an incredible way to see so many iconic locations: exotic scenery, interesting characters, and unique birds and wildlife, whilst making your way to the Tip of Australia and back. Cape York Four Wheel Drive tours are included, and, if you’re keen to wet the line, they can also arrange fishing tours at Cape York. 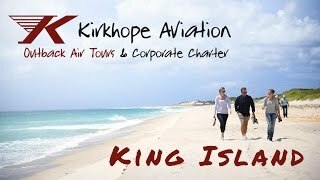 Like all Kirkhope Aviation Outback Air Tours, it’s fully inclusive — all you need to bring is your hat, sunscreen, sunglasses and some money for souvenirs! Cape York Air Safari is available on demand if your preferred travel date is not listed in the tour schedule. The Australian winter months is a fantastic time to visit the beautiful Australian Outback and, with their Taste of the Outback Air Tours, you’ll soon understand why this tour is one of their most popular. Taste of the Outback Air Tours can be either three or four days and include visits to iconic outback destinations, including Mungo Lake, Broken Hill, Innamincka and the Cooper Creek, Birdsville, Kati Thanda-Lake Eyre, Muloorina Station, William Creek, Arkaroola, and Flinders Ranges. Take a look at our video (below) to get an idea of the sort of activities you can expect. All Taste of the Outback Air Tours are available on demand if your preferred travel date is not listed in the tour schedule below. Give them a call, as they have a waiting list and continually schedule new flights to Lake Eyre. The Australian winter months are a fantastic time to visit the beautiful Australian Outback and, with their Taste of the Outback Air Tours, you’ll soon understand why this tour is one of their most popular. Taste of the Outback Air Tours can be either three or four days and include visits to iconic outback destinations, including Mungo Lake, Broken Hill, Innamincka and the Cooper Creek, Birdsville, Kati Thanda-Lake Eyre, Muloorina Station, William Creek, Arkaroola, and Flinders Ranges. Take a look at their video (below) to get an idea of the sort of activities you can expect. This memorable Kimberley and Northern Territory tour takes to you to remote and incredible places including the Kimberley in Western Australia, Arnhem Land and the Gulf and Australia’s Red Centre. The Kimberley Air Safari is available on demand if your preferred travel date is not listed in their upcoming tour schedule.